The Four stroke internal combustion engine is used in cars, trucks, motorcycles, construction machinery and many others applications. (W) Water jacket for coolant flow. 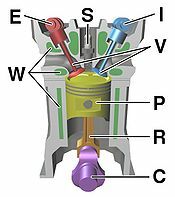 The four strokes refer to intake, compression, combustion and exhaust strokes that occur during two rotations of the crankshaft in a working cycle. Typically, T-shaped valves are operated by a camshaft which has a series of cams along its length, each designed to open a valve appropriately for the execution of intake or exhaust strokes while rotating at half crankshaft speed. A tappet between valve and cam furnishes a contact surface on which the cam slides to open the valve. A camshaft can be located in a variety of places within the engine. Most engines use overhead cams, or even dual overhead cams, in which cams directly actuate valves through a flat tappet. This design is typically capable of higher engine speeds because it gives the most direct and shortest inelastic path between cam and valve. In other engine designs, the cam shaft is placed in the crankcase and its motion transmitted by a push rod, rocker arms, and valve stems. This page was last edited on 24 November 2010, at 04:30.